How is shale gas different from conventional gas? The natural gas contained in shale reservoirs has the same primary chemical composition as the natural gas contained in conventional reservoirs – normally up to 95% methane. The main difference is in the geological and physical properties of the reservoirs in which the natural gas is stored rather than the composition of the gas itself. Shale reservoirs are often classified as ‘unconventional’ because they contain oil and natural gas that were generated in the shale itself, and because they do not naturally have sufficient permeability to allow the oil and gas to flow at commercial rates. 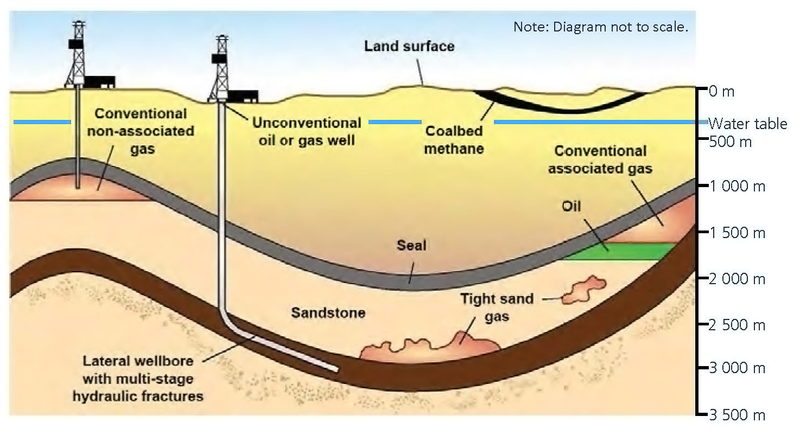 Unconventional gas generally occurs in very low permeability reservoirs (normally less than 0.1 millidarcy [mD]) with smaller, fewer or less interconnected pores, where fluids can barely flow. Shale gas reservoirs have especially low permeabilities, on the order of 0.001 mD. In order to recover the natural gas contained in these reservoirs, the effective permeability is increased by creating high conductivity channels in the form of fractures. These new paths allow the natural gas held in the reservoir to be released and recovered through the well up to the surface. On the other hand, conventional gas is located in higher permeability reservoirs (normally more than 0.1 mD) in geologic structural traps. These traps can include faults and anticlines, and stratigraphic changes of rock types (e.g. sandstone pinching out to shale or clay). These reservoirs tend to have many large, well-connected pores and transmit fluids readily.